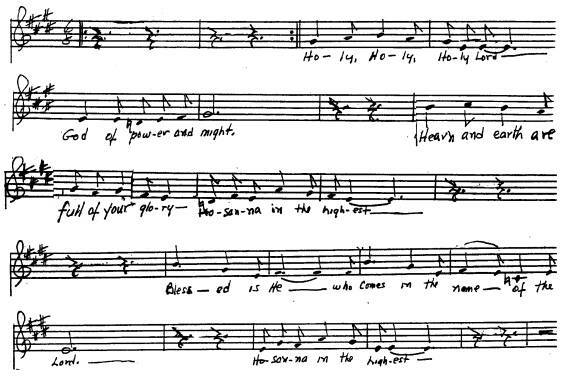 This congregational response was cut from a copy of the full score (voice + piano; notice system-joining lines to left of each staff). The strips of the voice part were laid on a scanner to create a computerized graphic (that’s why they’re crooked), which then (ouch) went into a church bulletin. The introduction on the full score is represented by two bars of rests surrounded by repeat signs. Notice the splices on the second and third staves, before “Heav’n” and “glory” respectively, as well as the lack of bar lines on the right side of each staff. Melody notes in the introduction are added as cue notes. Repeat signs on the first line in the handwritten copy were removed to enable the congregation to follow the full introduction easily. Eighth notes were beamed together for easier reading. 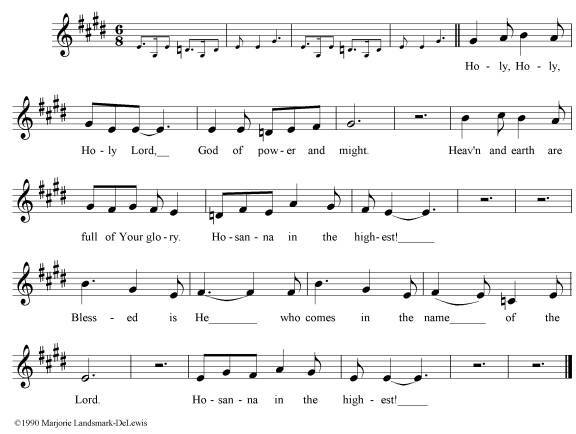 The “____” following “glory” on the third line and “Lord” on the last line in the handwritten copy were removed because they are redundant. Each staff now ends with the appropriate bar line. Finally, a copyright notice appears at bottom left.